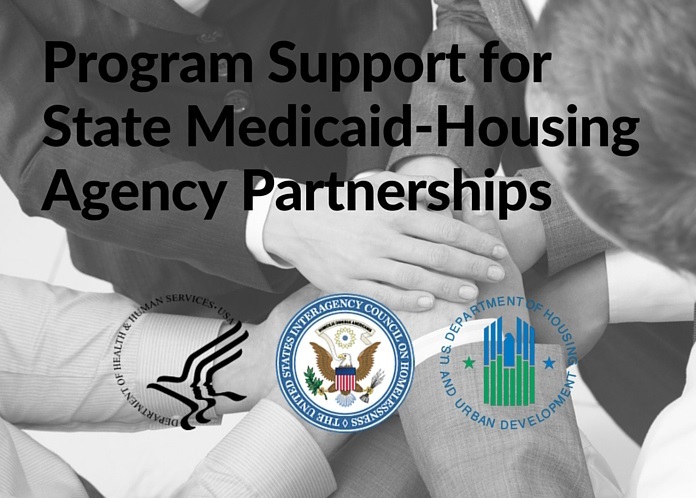 The U.S. Interagency Council on Homelessness (USICH), the Department of Housing and Urban Development (HUD), and the Department of Health and Human Services (HHS), in partnership with national organizations, are pleased to announce a new opportunity for states needing targeted program support aimed at strengthening state-level collaboration between health and housing agencies to bring to scale permanent supportive housing by coordinating housing resources with Medicaid-covered housing-related services. The Administration is committed to bringing to scale the cost-effective, evidence-based solution known as permanent supportive housing to end chronic homelessness in 2017, as well as to support the community integration for people with long-term services and supports needs. USICH, HUD, and HHS recognize that access to affordable, stable housing and access to coordinated and comprehensive health care services will improve health outcomes for Medicaid beneficiaries and lower health care and other public services costs for states and communities. Targeted at states with an existing foundation of collaboration between health and housing agencies, this effort will assist states to address two key challenges: 1) increasing the supply and availability of supportive housing stock targeted at low income persons with complex health needs, and 2) determining how to use Medicaid to cover services needed for achieving stable health and housing outcomes. Developing processes to ensure the quality and experience of providers who deliver benefits to the eligible population. To apply, state Medicaid, housing, and behavioral health agencies should work collaboratively to complete the Expression of Interest by December 1, 2015. The announcement was made by the Centers for Medicare & Medicaid Services (CMS) as part of coordinated program support being offered through their Medicaid Innovation Accelerator Program. Current state recipients of HUD’s Section 811 Project-Rental Assistance grants or SAMHSA’s Cooperative Agreement to Benefit Homeless Individuals for States are encouraged to support their state Medicaid agency to apply. Applications from Medicaid agencies will be received by the CMS and will be reviewed by teams of Federal agencies. If interested states feel that additional time is needed to complete the expression of interest form, please indicate this in on your form.